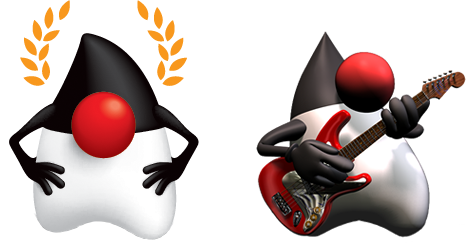 Both Maven and Gradle are popular choices when it comes to building Java projects. These tools share common traits but there are some key differences that make you more productive depending on a particular scenario (no, I’m not referring to the XML DSL vs. Groovy/Kotlin DSL schism), case in point scopes vs. configurations. Scopes and configurations are used by each tool to define dependencies and how they affect different classpaths, such as the compilation and runtime classpaths. Maven defines 6 scopes: compile, runtime, provided, system, test, and import. Gradle on the other hand defines the following configurations when the Java plugin is applied: annotationProcessor, compile, compileOnly, runtime, testAnnotationProcessor, testCompile, testCompileOnly, testRuntime. Actually Gradle defines a few more but these ought to be enough to get started. compile This is the default scope, used if none is specified. Compile dependencies are available in all classpaths of a project. Furthermore, those dependencies are propagated to dependent projects. provided This is much like compile, but indicates you expect the JDK or a container to provide the dependency at runtime. For example, when building a web application for the Java Enterprise Edition, you would set the dependency on the Servlet API and related Java EE APIs to scope provided because the web container provides those classes. This scope is only available on the compilation and test classpath, and is not transitive. runtime This scope indicates that the dependency is not required for compilation, but is for execution. It is in the runtime and test classpaths, but not the compile classpath. test This scope indicates that the dependency is not required for normal use of the application, and is only available for the test compilation and execution phases. This scope is not transitive. system This scope is similar to provided except that you have to provide the JAR which contains it explicitly. The artifact is always available and is not looked up in a repository. import (only available in Maven 2.0.9 or later) This scope is only supported on a dependency of type pom in the section. It indicates the dependency to be replaced with the effective list of dependencies in the specified POM’s section. Since they are replaced, dependencies with a scope of import do not actually participate in limiting the transitivity of a dependency. At the bottom of the scope hierarchy we find compile, used to define dependencies needed for compilation. Next we’ve got provided which also defines dependencies available for compilation. Dependencies defined by compile and provided must be resolved against a repository and they are also visible for runtime execution; the difference strives that provided should not expose its dependencies to the final packaging as they are expected to be provided by the hosting environment (hence the name), such as an application server. The third one is system which behaves like provided except that it does not require a repository for resolution, rather you must define a path (preferably a relative path to the root of the project) that points to the artifact’s location. Dependencies placed this scope are also visible at runtime but you must make sure they are reachable by their path. We move on to runtime, which as the name implies, are dependencies required during execution. Finally we find test, which builds on top of the previous 4 scopes, defining those dependencies required for both compilation and execution of tests. This looks like it might just work, however you now must remember to activate the prod profile whenever a production release must be made. Let’s see how Gradle manages this situation. The provided scope is a tricky one and turned out to be a sore issue between the Gradle community and the maintainers of Gradle for years. The semantics of provided as Maven defines them are mixed from the POV of the Gradle maintainers, as this scope allows you to define dependencies that are needed for compilation only, even for those projects where an application container is not needed. What happened with this scope goes a bit like this: webapps were on the rise in early days of Maven; an option was needed to specify those dependencies provided by an application container in such a way that the final package (a WAR file) would not include said dependencies (for exaple the Servlet API JAR file). As Maven grew in popularity it was used to build all kinds of projects, some required the semantics of provided but were not web application projects. When annotation processor projects came to use (such as Lombok, AutoValue, Dagger, etc) it became clear that such components should form part of the compilation step but are not needed during execution, thus the only option for Maven users was to use the provided scope to define such dependencies. Gradle refused to deliver a provided configuration for years; there were 3rd party plugins that delivered this feature until a time came when the compileOnly and testCompileOnly configurations came to be. These two configurations make it more explicit what they are supposed to be, and can be used to replicate the behavior of Maven’s provided scope without mixed semantics. Coming back to annotation processors, for a while the compileOnly and testCompileOnly where the preferred choice for defining such dependencies, nowadays there are brand new configurations (annotationProcessor and testAnnotationProcessor) that take advantage of Gradle’s build cache to provide better semantics and faster builds. runtime - Runtime dependencies for source set 'main' (deprecated, use 'runtimeOnly ' instead). testRuntime - Runtime dependencies for source set 'test' (deprecated, use 'testRuntimeOnly ' instead). You may be wondering, what happened to the system scope mapping? Is it possible to have something like that in Gradle? Of course it is! Remember that system is a combination of provided plus a local path in such a way that the artifact is referenced directly from that path instead of being resolved by a repository. Gradle lets you define multiple types of repositories, one of them being flatDir, which can be used with any configuration you like, thus giving you more flexibility than the limited system scope found in Maven. TL;DR: Gradle configurations deliver finer granularity for defining compilation & execution classpaths than Maven scopes do.